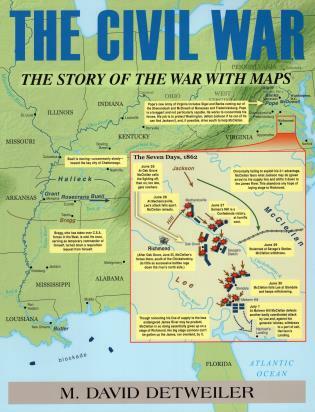 The Civil War: The Story of the War with Maps combines the colorful, detailed maps of an atlas with the vivid storytelling of the best narratives to piece together the nation-spanning jigsaw puzzle of the American Civil War. See the conflict develop from a few small armies into total war engulfing the whole South. The campaigns and battles are all here, with maps zooming in on the maneuvering and attacking armies: Bull Run, Shiloh, Antietam, Fredericksburg, Chickamauga, Chattanooga, the Wilderness, Atlanta, and more. The nationwide perspective--absent from so many other books and shown here on full-page maps--connects these dots into a cohesive story of the entire war, from the Atlantic Ocean to the Mississippi River, from Pennsylvania to the Gulf of Mexico. Distilling events into their essentials, the text focuses on the military history of the conflict and its cast of colorful commanders--Lee, Grant, Sherman, McClellan, and Stonewall Jackson. Captures all the war's intensity and human drama, its epic sweep from Sumter to Appomattox. The result is a unique book that educates, enlightens, and entertains. An ideal introduction for newcomers, refresher for buffs, and companion to other books during the warâ€™s 150th anniversary and beyond. M. David Detweiler graduated from Yale and has worked as a journalist and editor and published short stories and novels. He was the key editor for Gettysburg: The Story of the Battle with Maps. Detweiler is an amateur military history buff, composer, and sometime fly angler. President and CEO of Stackpole Inc. for the past quarter century, he lives in Harrisburg, Pennsylvania, with his wife and enjoys chasing the unsolvable what-ifs of history.